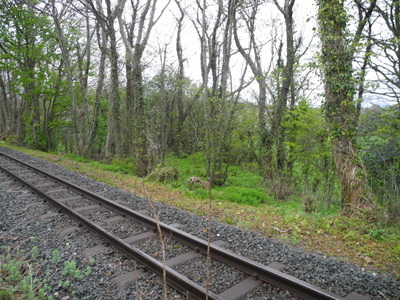 On the embankment beyond Plas y Bont bridge, the Nantlle route starts to diverge to the right of the WHR.The line is heavily overgrown but can just be seen here in the trees on the far side of the track. Its embankment, covered in trees, crosses a field and approaches the river. 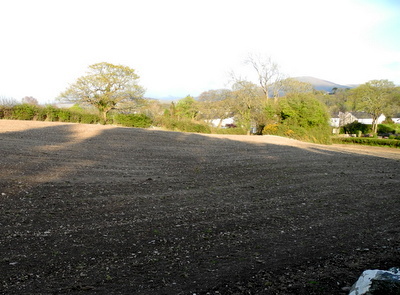 At this point, on the left of this view, it is breached by a farm access route. 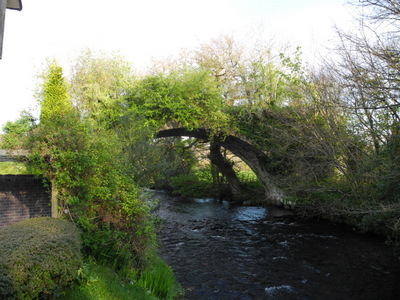 Seen here from the west, the bridge over the Afon Gwyrfai still stands, albeit rather overgrown and decayed. 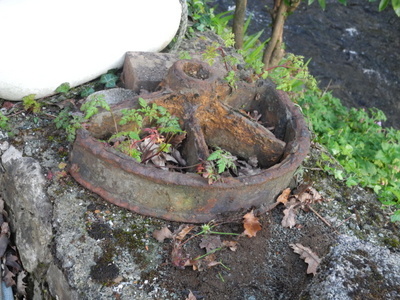 The bridge is a listed monument and the Royal Commission on Ancient and Historical Monuments in Wales describes the bridge thus: …a span of 15.3 metres and being 6.15 metres wide at the base, but narrower at the crown, which was not accessible. The height of the arch was 4.6 metres from the springing level that was approximately one metre above the water level. The arch was made from large rusticated stone blocks that were 70 centimetres deep. 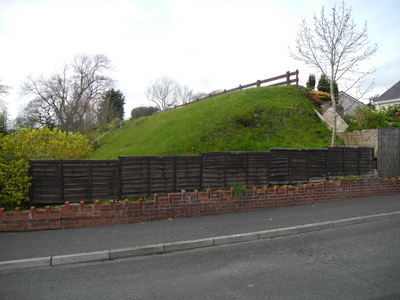 Both approach embankments were visible, standing up to 4.5 metres high on the south side, although they been quarried and cut for farm access and housing estate roads. 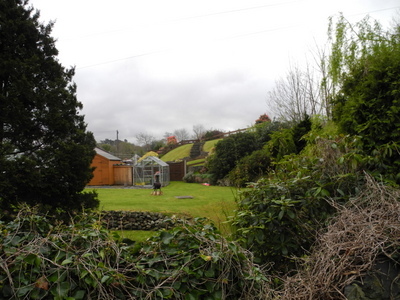 After the bridge, which stands just behind this house, the embankment curves sharply to the left. A modern housing estate has grown up around the embankment which provides an attractive backdrop to some of the gardens. 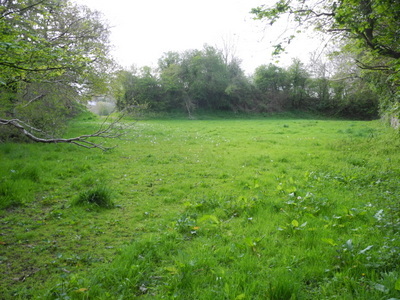 The embankment is breached here by the estate road.. 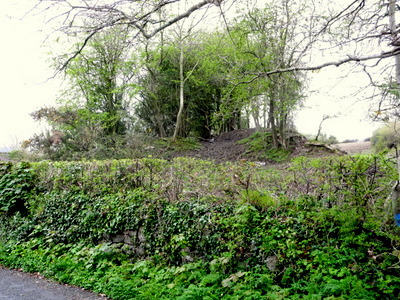 The lane from Bontnewydd to Llanfaglan creates a further breach in the embankment at its northern end, and a wooded mound in the field is the final remainder. 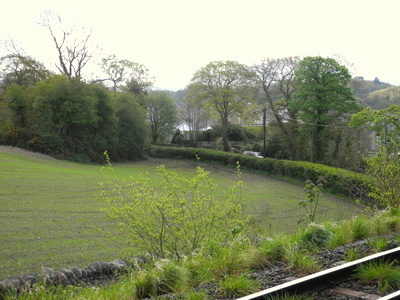 Seen from the WHR above, the embankment ends in the clump of trees to the left. 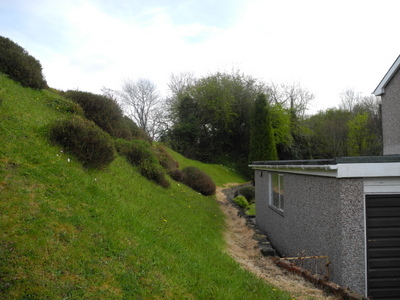 Despite appearances, the Nantlle route over the embankment was only about six feet below its successor. 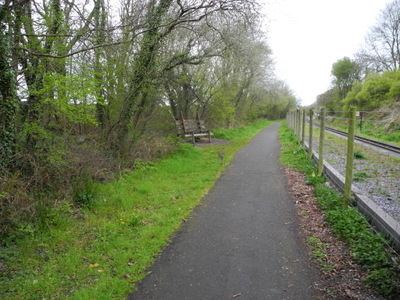 Crossing the WHR, the line curves round to merge with it beyond Bontnewydd station, giving rise to the widened formation behind the seat.